A luxurious all-suite oceanfront resort in the heart of Marina Vallarta, offering 345 suites, three swimming pools, fitness club and spa. Amenities: One bedroom with one king or two single beds, plus sofa bed, kitchenette includes mini-bar, microwave oven, blender, coffee maker, toaster and cooking utensils, dining area, individually controlled air conditioning and ceiling fans, direct dial telephones, satellite color TV and safe deposit boxes. No balcony. Maximum Occupancy: Two adults and two children or three adults and no children. Amenities: One bedroom with one king or two single beds, living and dining room, fully-equipped kitchen including refrigerator, microwave oven, blender, coffee maker, toaster and cooking utensils, living area, individually controlled air conditioning and ceiling fans, direct dial telephones, satellite color TV and safe deposit boxes. Ocean view, balcony or terrace, ironing equipment. Amenities: One bedroom with one king bed the other with two double beds, living and dining room, fully-equipped kitchen including refrigerator, microwave oven, blender, coffee maker, toaster and cooking utensils, living area, individually controlled air conditioning and ceiling fans, direct dial telephones, satellite color TV and safe deposit boxes. Ocean view, balcony or terrace, ironing equipment. Amenities: Two bedrooms with one king bed, living and dining room, fully-equipped kitchen including refrigerator, microwave, blender, coffee maker, toaster and cooking utensils, living area, individually controlled air conditioning and ceiling fans, direct dial telephones, satellite color TV, safe deposit box, L`Occitane bath amenities and bath robes/slippers. Located just 2 miles/3 kilometers from the international airport (PVR), 4 miles/6 kilometers from downtown Puerto Vallarta and in the heart of Marina Vallarta, surrounded by shops and the Marina Golf course. The perfect place to Experience the wonders of Puerto Vallarta. 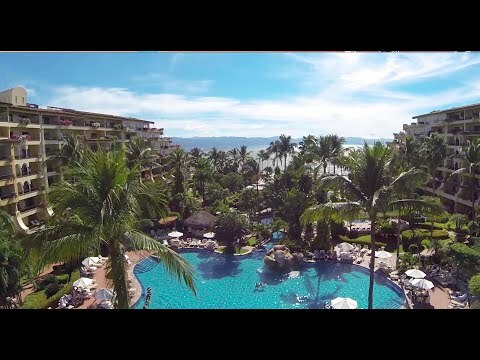 Set on the western coast of Mexico, sheltered by the jungle-covered Sierra Madre Mountains and located along the waters of Banderas Bay, Puerto Vallarta offers a perfect tropical climate in one of the world`s most beautiful places. Over the years this amazing city has received many global accolades that are a testament to its uniqueness and warmth. For example, it has been voted the friendliest city in the world by Cond Nast Magazine (2003), the best place to retire globally by The American Association of Retired Persons (2010) and the best Mexican Vacation destination by USNews.com (2010), beating out Cancun and Los Cabos for the top prize. Velas Vallarta Suite Resort is located on a lush, 10-acre, oceanfront property, within walking distance of Marina Vallarta, the most modern marina in Puerto Vallarta, with more than 300 yacht-sized slips. Most of the oversized suites offer a breathtaking ocean view of the magnificent Bay of Banderas. Three beautifully landscaped swimming pools, including one with a waterfall, provide a refreshing setting for sunbathing and relaxing. Indulge in luxury and comfort in spacious, beautifully-appointed suites overlooking the emerald waters of Banderas Bay. This upscale all-suites resort features 345 luxury suites including studios, one-, two- and three-bedroom suites, as well as Master Suites and Ocean Front Suites. Designed with tropical-inspired decor, contemporary furnishings, lifestyle enhancing amenities, ocean and garden view with balconies, the Suites offer an unforgettable vacation experience. Indulge in a culinary adventure at Velas Vallarta, where flavor and culture blend in perfect harmony. This resort offers excellent restaurant options, from gourmet dining to a beachside bistro. Enjoy international cuisines at Andrea Restaurant, Alejandra Restaurant (seasonal), and La Ribera Restaurant. Swim up to the Aqua Bar for a tropical drink, grab a light bite at the Snack Bar or enjoy live entertainment, music, and cocktails at the Alhambra Lobby Bar. This resort has everything you could want to make that dream vacation a reality. Their three beautifully landscaped swimming pools, including one with a cascading waterfall and a kid`s pool, provide a refreshing setting for sunbathing, swimming and relaxing on the bay. Swim and soak up the rays on their beautiful beach where the gentle waters lap against the alabaster sand. You can tee off on the nearby championship golf course. If you want to stay in shape while on vacation, you can enjoy an invigorating workout in their fully-equipped Fitness Club. Velas Vallarta also features a high-tech Convention Center to meet all of your conference or meeting needs. Experience a world of total relaxation that will revitalize your body, mind and spirit at the resort spa. Enjoy the soothing and balancing effects of a massage or a rejuvenating facial treatment as you relax in a tropical paradise. Listen to the sound of the crashing waves with an ocean front massage. Velas Vallarta spa offers the best aromas, products and service protocols to ensure each spa treatment becomes a memorable and magical experience. Their luxurious indoor spa features three indoor treatment rooms for massage, a hydrotherapy area, a sauna, a room for facials, and an intimate beauty salon where Guests can enjoy complete hair care, style services, waxing and foot and hand care. By request, spa treatments can also be enjoyed with a partner, together in the same room. For the ultimate in relaxation, visit their outdoor spa facility located on the jetty above the calm azure waters. Experience a private massage right on their peaceful beach with the soothing sounds of the gently rolling waves. For a truly romantic and relaxing spa experience, Guests can also enjoy a beachside couples massage.